In this blog post, I am going to let you know about how to make contact form using Jquery? A contact form is a very important part in your website which provides an interface between you and your users or customer. If you are looking to make an attractive contact form then you are landed at the right place. Here we will teach you how to make this contact form with full code support. How to make this contact Form? This is a very simple process, you just to follow the step by step procedure given below. Though you can use any suitable platform or software as per your comfort. Create a project name as contact_form. If you have no idea how to create a project using NetBeans then please go through the below link. How to make your first project using NetBeans? given below. 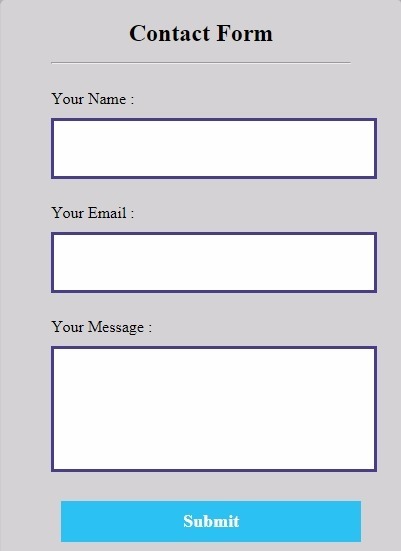 After this run your project and you will see a attractive contact form. See the below image. // Here we are fetching HTML Elements in Variables by ID. // we have used the Google Fonts with the below import link. XAMPP SERVER: What is Xampp Server? How to make sliding contact form using java script?